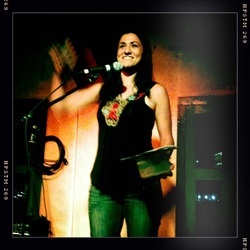 Arianna Pozzuoli is an educator, spoken word performer and storyteller. In December of 2006, she competed in her first Poetry Slam and won. Since then, she has competed at the Individual World Poetry Championship in Vancouver, British Columbia, the Canadian Festival of Spoken Word in Halifax, Nova Scotia and Calgary, Alberta, the Women of the World Slam in Detroit, Michigan and the American National Poetry Slam in Madison, Wisconsin. She is a two-time member of the Toronto Slam Team and has competed and featured at various venues across North America, the UK, Singapore, Malaysia, the Philippines and Australia. She is currently a Drama teacher at the Canadian International School of Singapore and occasionally hosts Word Forward’s monthly Poetry Slams. ‘Something for Everyone’ is her first poetry collection. "Arianna's poetry has that satisfying mix of intelligence, humour and vivid imagery, all wrapped in a stage presence that has made her one of the most compelling poets I've seen."